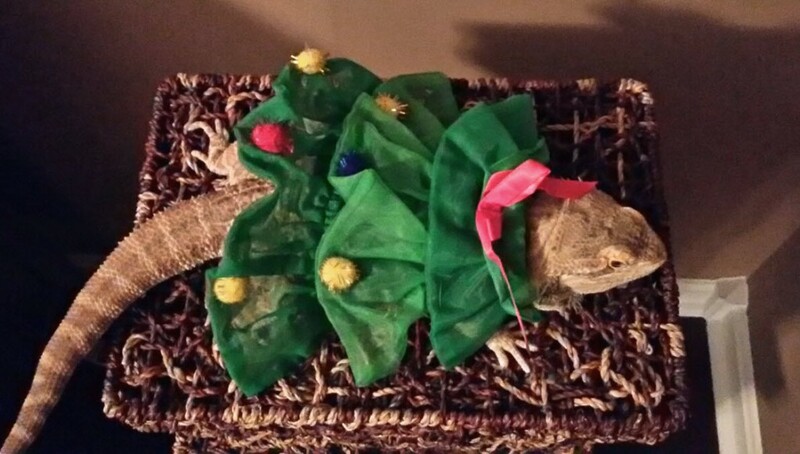 Sew a festive dress for your bearded dragon that looks like a Christmas Tree! Measure your pet and cut a rectangle of green fabric to lay over their back. Cut four strips of green sheer fabric to the lengths needed. Hem the bottom edge of each piece of sheer fabric using hem tape. Sew the top edge of each piece of sheer fabric onto the green rectangle. Sew one side of an elastic band under the top and belly area of the dress as straps and sew a snap fastener on the other side of each band. Sew a bow on the top of the dress and pom-poms on the body of the dress.